WBC heavyweight champion Deontay Wilder and challenger Artur Szpilka promote Saturday's title fight at the Barclays Center in Brooklyn across the five boroughs this week. Boxer Deontay Wilder of the US poses for photos with World Trade Center One in the background January 13, 2016 in New York. Boxer Artur Szpilka of Poland does a tv interview inside World Trade Center Four January 13, 2016 in New York. Szpilka will face Deontay Wilder and for the WBC world heavyweight title January 16, 2016 in New York. Boxers Deontay Wilder (L)of the US and Artur Szpilka of Poland pose for photos inside World Trade Center Four January 13, 2016 in New york. Boxers Deontay Wilder(L)of the US and Artur Szpilka of Poland pose for photos with World Trade Center One as a background January 13, 2016 in New york. Boxer Deontay Wilder (L) of the US takes a swing during a workout at Gleason's Gym in New York on January 12, 2016. Martin is scheduled to fight Vyacheslav Glazkov of Ukarine for the IBF world heavyweight title January 16, 2016 in New York. Boxer Deontay Wilder (R) of the US takes a swing during a workout at Gleason's Gym in New York on January 12, 2016. Martin is scheduled to fight Vyacheslav Glazkov of Ukarine for the IBF world heavyweight title January 16, 2016 in New York. Boxer Artur Szpilka of Poliand flexes after a workout at Gleason's Gym in New York on January 12, 2016. Szpilka is scheduled to fight Deontay Wilder of the US for the WBC world heavyweight title January 16, 2016 in New York. Boxer Artur Szpilka of Poliand hits a ball attached to his head by a rubber string during a workout at Gleason's Gym in New York on January 12, 2016. Szpilka is scheduled to fight Deontay Wilder of the US for the WBC world heavyweight title January 16, 2016 in New York. Boxer Artur Szpilka of Poliand warms up during a workout at Gleason's Gym in New York on January 12, 2016. Szpilka is scheduled to fight Deontay Wilder of the US for the WBC world heavyweight title January 16, 2016 in New York. Deontay Wilder in front of One World Trade Center on January 13, 2016 in New York City. Deontay Wilder poses for a picture during a portrait and media availability on the terrace at Four World Trade Center on January 13, 2016 in New York City. 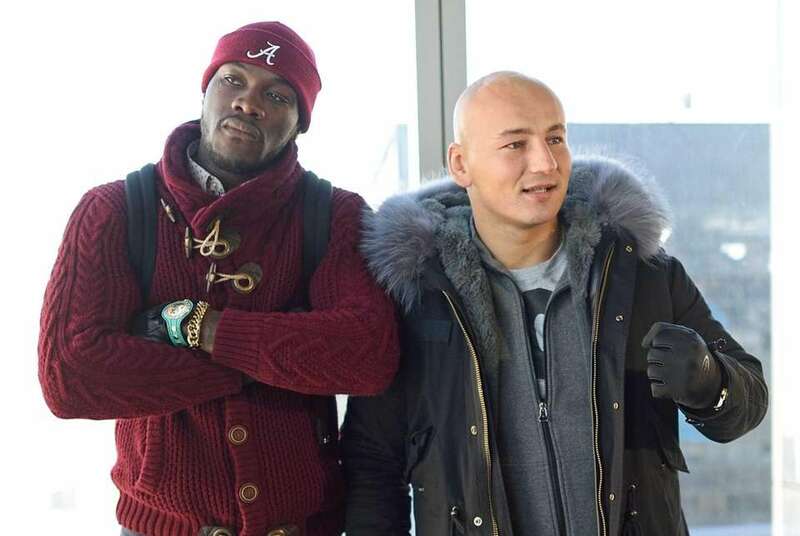 Deontay Wilder and Artur Szpilka pose for a picture during a portrait and media availability on the terrace at Four World Trade Center on January 13, 2016 in New York City. Deontay Wilder and Artur Szpilka exchange words during a portrait and media availability on the terrace at Four World Trade Center on January 13, 2016 in New York City. Deontay Wilder is held back as he argues with Artur Szpilka during a portrait and media availability on the terrace at Four World Trade Center on January 13, 2016 in New York City.